As a child, I always looked forward to the Rupert Bear Annual that we received at Christmas, because each one included instructions for folding from paper some object that featured in the stories – a boat, a plane, a box, a kettle, or whatever. I'd never heard of Origami then, but much later I was given a large book on Origami, and made many animals, birds and other objects, all of which have since gone. I also developed an interest in folding paper tape . . .
Punched paper tape was a standard way to store data and enter it into computers in the 1960s and 70s. The tape came in reels, and since most jobs used less than a whole reel, there was often some tape left over and discarded. Tape came in three sizes: 5-hole, 7-hole and 8-hole, and also came in different colours. Many people use the tape for decorations, but I was interested in using it for more mathematical purposes. For example, can polyhedra be made out of paper tape, just by folding, and if so, which can be made with a single strip? Here are the things I made. NB – Over the years the colour of much of the tape has faded from exposure to sunlight – for example the truncated octahedron was originally two fairly bright shades of blue. * The pentagons are formed by tying an overhand knot in the tape. I then moved on to other regular and irregular polyhedra. At the time I don't think I knew the names of them all, but I later found them here . * The hexagons are formed by strips woven together. As a result, they appear to be composed mostly of trianges, with a few rhombuses (two triangles together), but since they are co-planar, they are counted as single hexagons rather than multiple triangles. 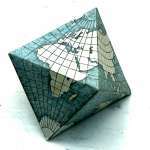 ** I imposed the constraint that tape could only be folded along an edge of the polyhedron. WIth that constraint I needed two separate strips (different colours in the model). All 6 squares are one colour, along with 20 of the triangular facets of the 8 hexagons. The remaining 28 triangular facets are the other colour. So an area equal to 16 squares of the first colour is visible, while only an area equal to 14 squares of the second colour is visible. I don't know whether the areas could be made equal by a different folding. I suspect it can't be produced with a single strip. I was attracted to the fact that they can be plugged together to make more complex shapes, especially by using different with tape. The 'side spikes' of 5-hole tape fit the 'corner spikes' of 7-hole tape, which makes it possible to attach stars at 45 degree angles as well as at 90 degrees. Frank King showed me an octahedron and a truncated cube, and I made both, but only the octahedron survives. When new, the shapes hold together by friction, but as the paper ages, the stars are more likely to come apart if disturbed. I wanted to do something more. Frank and I were both interested in the torus, and I devised a way of making one. It has four-way, rather than circular symmetry. It uses all three widths of tape (5-hole, 7-hole and 8-hole). Being so large, friction was not enough to ensure that all stars remained plugged together, especially if it was picked up. I solved this problem by threading two lengths of cotton round the major loop (one round the outside and one round the 'hole). The threads run through the insides of the stars, so they are invisible. Click the pictures to enlarge. At the time, I was also fascinated by the klein bottle. I made some out of various flexible materials, but more interesting is the one made from folded paper tape. All angles are right angles, and the tape is woven diagonally. Most of the 'tube' is 2D x 2D, where D is the 45° diagonal width of the tape. This increases to 3D x 3D for the outer part where it passes inside itself. Where it goes through itself, the corners of the part going through are folded back on themselves, and the middles of the opening in the larger tube through which it passes are also folded back on themselves. As far as I can remember, I made it with one piece of tape. I made a small paper model with squared paper to plan there the tapes would go. At the same time, I provided a woven fish – nothing special, but interesting. I also made some polyhedral maps of the world, inspired by an article in Scientific American Only one survives, but I have a picture of both of them in a bowl of fruit.